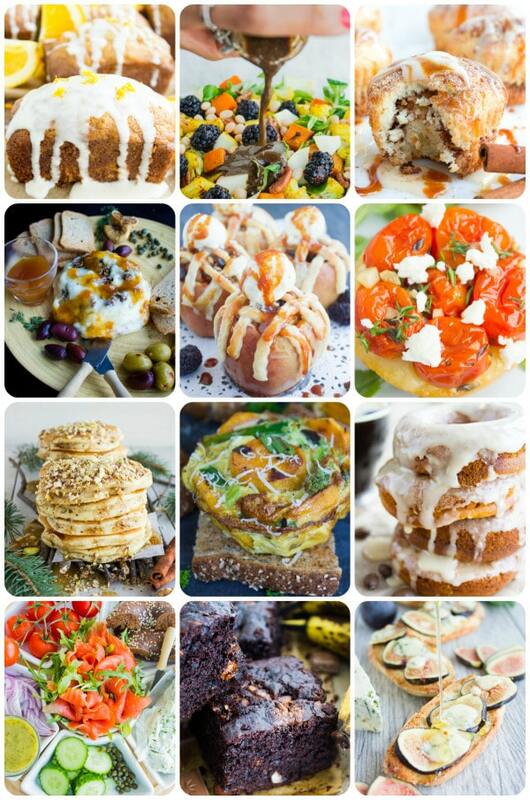 This 12 last minute Holiday Day favorites recipe collection is a blend of sweet and savory, amazing, easy and QUICK impressive additions to your Holiday table–that you can really pull up last minute! And even if you’re not a last minute person, well these recipes will be your time savers this Holiday! Whether you’re hosting or visiting, pick one of these and enjoy your Holiday table this year with ease and love! Ok, is it just me, or did this year just swoop by !?! I can still vividly remember details of this time last year–the parties, the people, the gifts, the details.. So every December here, we go through plenty, and I mean plenty of kids parties, gingerbread parties and more! Then I go through plenty of special Holiday events at the cooking school, where I organize a day of cooking and dining something special for different teams who’ve been gifted this special day by their directors. So as exhausting as all this may sound (and it is! ), it’s absolutely joyful! 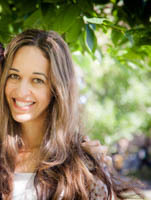 Towards the end of the month, we’ve usually seen Santa and his gifts at least 4 times, and I’ve gone though quite a bit of Holiday Dinners, and by the actual Holiday–we’re all quite exhausted–but we’re still in a Happy Holiday mood…So today I gathered up these 12 last minute Holiday Day favorites for the busy exhausted person in you too! Ok last minuters, or planners–these 12 last minute Holiday Day favorites are here to save you time and keep you in the Happy Holiday mood–without missing on the good food! Here they are broken down three recipes at a time–pick you favorite(s) and ENJOY!! 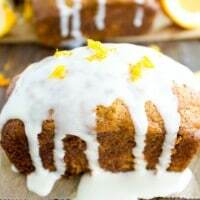 Best Orange Carrot Cakes: These are really and truly the BEST carrot cakes you’ll ever taste–very carrot-y, slightly orange-y, NOT a bit greasy, SUPER tender and fluffy! 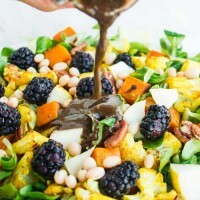 Blackberry Pecan Roast Veggie Power Salad: This a warm and heart warming salad that’s bursting with colors, flavours and textures–roasted cauliflower and sweet potatoes, pecans, blackberries, pears, watercress and navy beans all dressed up in a basil balsamic vinaigrette! 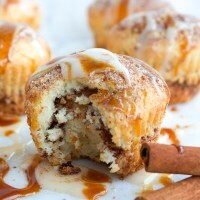 Cinnamon Rolls Muffins: Every time you crave a cinnamon roll in a rush, reach for these–tender, fluffy muffins stuffed and topped with cinnamon sugar and all dressed up with caramel sauce and cream cheese icing! 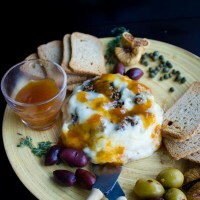 Fig Olive Tapenade Stuffed Brie: A show stopping start to any table–5 mins fig olive balsamic caper tapenade gets stuffed into a whole round of brie cheese and then covered on top–bake this for 10 min and you’ll impress yourself! 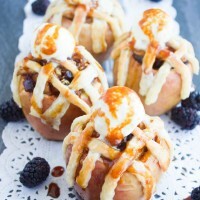 Apple Pie Stuffed Apples: All the flavors and comfort of your favorite apple pie, only made easier, healthier and faster! Cored whole apples stuffed with bits of apples, cranberries, sugar and spice, then covered with a step by step easy lattice top and baked for the ultimate apple pie experience! 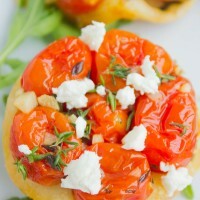 Tomato Tarts Tatin: As fancy and gorgeous looking as this French appetizer sounds, it’s actually shamefully easy, quick and absolutely luscious! Only 5 ingredients and 15 mins–how can you resist! 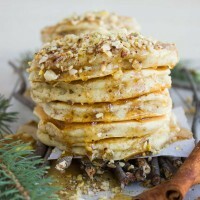 Baklava Pancakes with Maple Syrup: These are SUPER fluffy, tender like your favorite pancakes–but they’re absolutely not your average pancakes! With crushed nuts, cinnamon, orange zest specks in the batter and more its on top–these baklava pancakes are a must try for pancakes and baklava lovers! 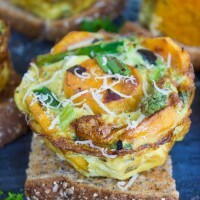 Kale Veggie Mini Frittata: The perfect egg breakfast–loaded with veggies and baked in a muffin pan for a beautiful flavorful mini frittata in a snap! 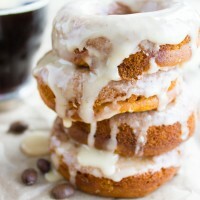 Espresso Glazed Pumpkin Spice Donuts: Let me STOP you right there and say these are BAKED not fried, these are tender NOT dry, these are so PUMPKIN-y, not tasteless or only spice tasting, these take 18 minus to bake and 5 mins to prepare–these are absolutely the best cake like baked donuts on the planet! 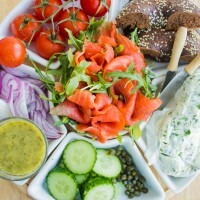 Easy Smoked Salmon Platter: This is a no cook no fuss just gather up and make a vibrant colourful platter with just a few condiments–a sweet mustard dill sauce and a 2 mins homemade herb garlic cream cheese spread–simplicity at its best! 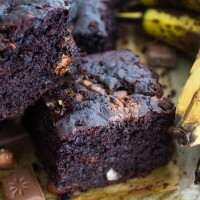 Chocolate Banana Chocolate Chip Cake: We can’t miss chocolate from our round up–this one bowl one whisk cake is a dark chocolate cake made ultra moist with bananas, super tender and fluffy, loaded up with chocolate chips and hazelnuts–it’s a chocoholic dream cake! 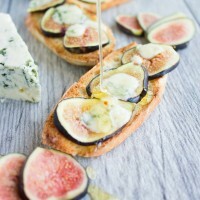 Fig Blue Cheese Honey Crostini: 5 mins to spare? any fruit, any cheese works like a charm here! Lovely crusty baguette slices topped with sweet slices of ripe figs, crumbles of blue cheese and baked for 5 mins until warm for a sweet, salty, crunchy and melt in your mouth joy in every bite!